I took a week of leave (starting on Monday) to get prepared for all the Christmas baking. If you’ve followed me on Facebook page, you’d probably have seen some photos popping up on the page, those are what I’ve been busy with during the week – baking macarons (4 flavours, failed 1), cookies (another 4 flavours, all taste pretty good! ), cupcakes and Swiss roll (with a twist, shall post photo of that later when I’ve finished filling it). So if you want to see what’s baking/cooking in my kitchen, do follow my Facebook page! I was really lazy to go out and buy myself lunch, so I decided to whip up some simple one-person-meal – I planned what I wanted to eat, bought all the groceries during the weekend, and in just less than 30 minutes, I got myself a delicious and nutritious plate of lunch during the week. 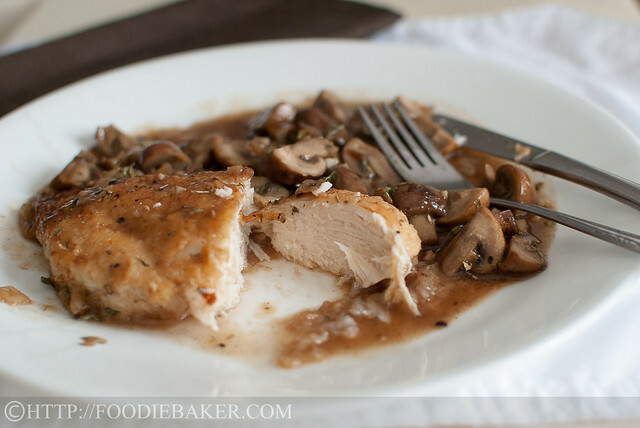 Chicken and mushrooms – a lovely combo! I used boneless and skinless chicken breast for this dish. The upside of using chicken breast is that it cooks fast – and boneless means convenience while skinless means less fat. The downside, however, is that the meat is not as tender and as juicy as other parts. Luckily, I didn’t overcook them, so the meat’s not very tough and there were mushroom juices for me to dip the chicken meat on, so it turned out to be really yummy. 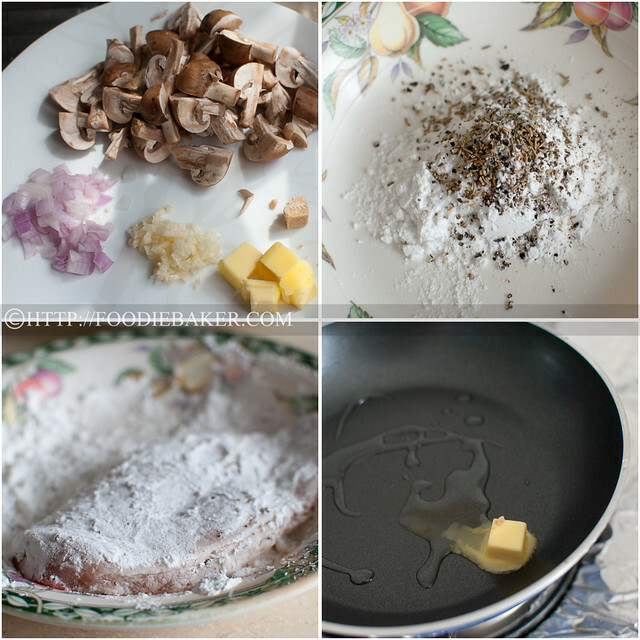 Prepare all the ingredients – mushrooms, onion, garlic, butter, chicken stock cube, chicken breast (not pictured). Season the corn flour with salt, black pepper and some herbs (I used rosemary). Dip the chicken breast in the seasoned flour. Melt some butter in a frying pan with some oil. Pan-fry the chicken until golden-brown and thoroughly cooked. Remove the chicken, add in more butter and fry the onion and garlic. Add in mushrooms and let them cook. Add in water and crumble the chicken stock cube into the pan, cook until the liquid has reduced in half. I am submitting this recipe to Cook Like A Star, an event hosted by hosted by Zoe from Bake for Happy Kids, Baby Sumo from Eat your heart out and Riceball from Riceball Eats. The event is hosted every bi-monthly and the theme for this month is Martha Stewart. Coat both sides of the chicken breast in the seasoned flour. Heat oil and ¼ tablespoon butter in a frying pan over medium-high heat until the butter has melted and starts to bubble. Cook the chicken, turning down the heat if needed, until both sides are golden-brown and cooked through, about 3 minutes on each side. Transfer the chicken onto a serving plate and keep warm. Heat the remaining ½ tablespoon butter (no need to wash the pan). Add in the onion and garlic and cook until fragrant. 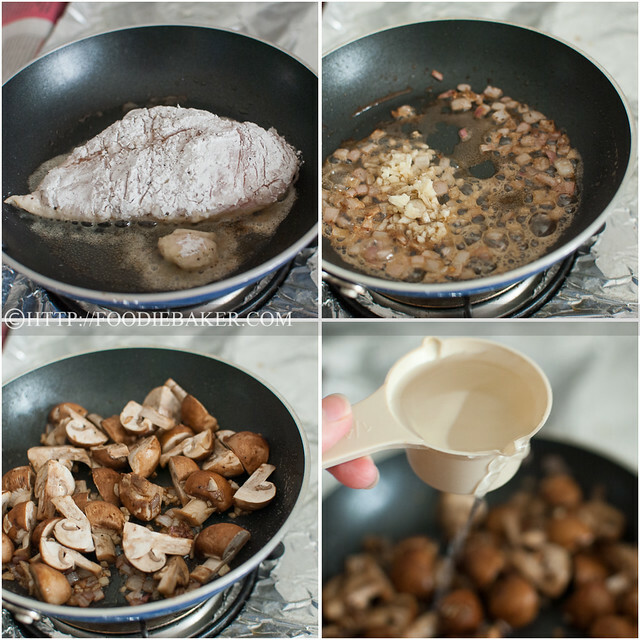 Add in the mushrooms and cook until the mushrooms have reduced. Add in the chicken stock and cook until the liquid has reduced by half. Season with salt, black pepper and herbs (if using). Scoop the sauce over the chicken and serve. This was a great dish! 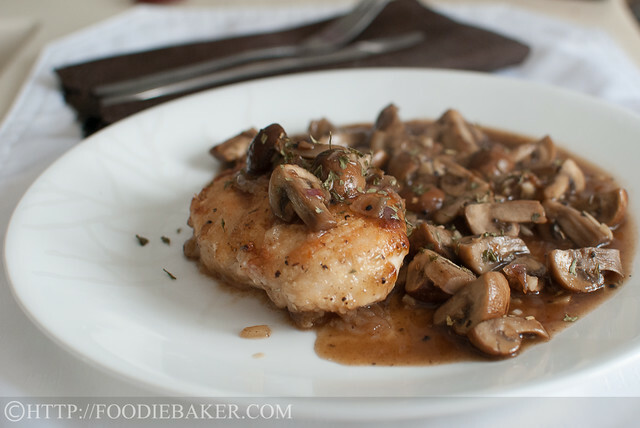 I added a little marsala cooking wine to the chicken stock and it kicked it up a notch! Recipe was easy and simple. Definitely making it again! Mushrooms are one of my many favorites too 🙂 I just recooked it a few days back and I really love it, it’s super delicious and easy. mmm..can imagine how tasty the mushrooom sauce is, looks very inviting! the plus point is it’s also very simple to cook! Thank you 🙂 I love the combination too! Hi Anne! Yes, the mushroom and chicken combination is very delicious 🙂 Well I failed 5 batches of macarons before that before I got my it right and sometimes I can still get it wrong! Macarons sometimes are so hard to get it right, don’t you think so? Hi Katerina, we definitely survived this day, so it’s time to cook it! 😉 Have a great day ahead! Thank you so much John, hope I’m not making you too hungry! 😉 Have a great week ahead and take care! It is yum! It was a lovely combination, juicy mushrooms with crispy chicken, perfect! Thank you for the compliments Suzanne! Have a great week ahead! Ooh, the mushrooms and sauce look delicious. Great chicken dish! This chicken looks absolutely delicious Jasline and if we manage to survive this day today then I will definitely put this on my list of recipes lol! 1 week of Christmas baking… I would love to have 1 week of peace and quiet moment to do my baking. Oh, how I’d love this dish, Jasline! First of all, the aroma of mushrooms sautéing with rosemary is one of those scents that makes my mouth water. Both go so well with chicken that this dish just cannot fail. I’ve pinned it and will be making this for dinner very soon. Thanks for sharing. Bet that was yum! 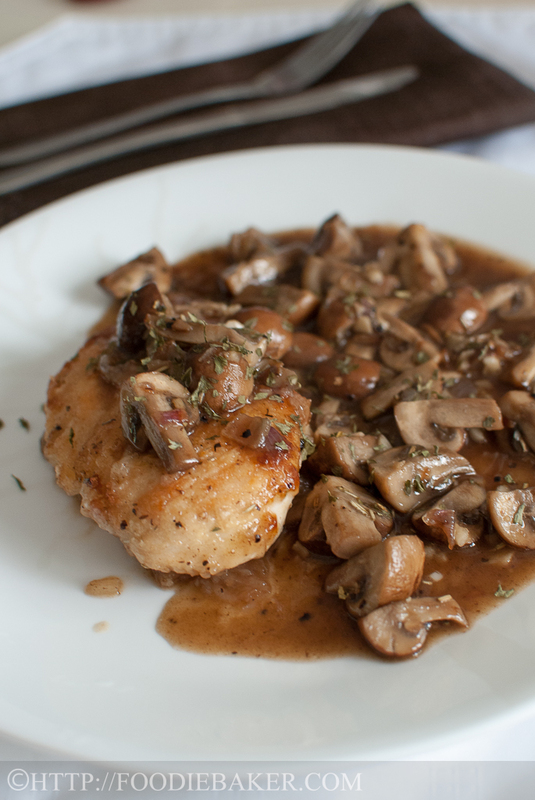 Love chicken with mushrooms – has to be one of my favourites. Love how simple this dish is, and really delicious. Your photo’s literally jump off the screen, they are beautiful! Looks like a great meal. No need to go out to eat when you can whip that up on half an hour.